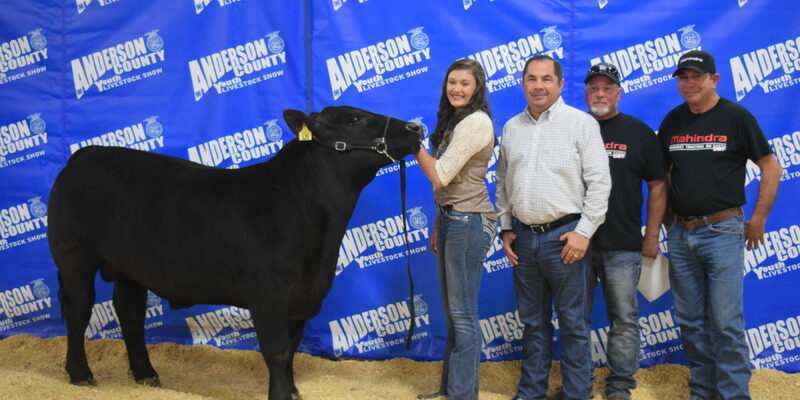 ANDERSON COUNTY – It seems like just last week the 2018 Anderson County Youth Livestock Association Livestock Show wrapped up, but here we are a year later as the 2019 extravaganza gets underway this week. The weeklong event is set to begin on Sunday, April 14 with check-in between 1pm and 5 pm. All animals except broilers, rabbits and breeding goats are to be checked during this time frame. Commercial heifer record books are due at this time. At 5:30 pm, the official weigh-in of market animals will commence. The order of the weigh-in will be steers, lambs, goats and hogs. On Monday, April 15, the action kicks off bright and early with the broiler check-in between 7 and 9 am. After the broilers are checked in, project show check-ins will begin at 9 am and run until 12 pm. At 10:30 am, the broiler judging will begin. Non-placing broilers need to go home by 10pm on the day of the judging. At noon on Monday, the check-in for market rabbits begins and lasts until 2 pm. Commercial heifer interviews begin at 1 pm with the commercial heifer judging starting at 1:30 pm. Starting at 3 pm, the market rabbit judging will begin with pictures taken immediately after the judging concludes. Non-placing rabbits must be removed from the show grounds at the conclusion of the judging, unless the entrant is participating in a showmanship class. The breeding gilt show will begin at 7 pm. There is no showmanship for this class. Also, at 8 am, the project show judging gets underway. Beginning at 11 am and lasting until 12:30 pm will be the check-in for breeding goats with the breeding goat show to follow immediately afterwards. At 3 pm, the market goat judging begins. The judging will be by the Junior and Senior Showmanship and sale order placing. At 6 pm, the market swine judging begins and will be followed by Junior and Senior Showmanship, along with sale order placing. Pictures of the market swine will be taken as the sale order is placed. On Wednesday, April 17, the day begins at 8 am as market swine that did not qualify for the premium sale may start checking out. At 3:30 pm, lamb judging begins and will be followed by the Junior and Senior Showmanship along with sale order placing. Broiler and lamb pictures will be taken Monday evening, following the judging. Starting at 5:30 pm, the breeding heifer judging will start and will be followed by Junior and Senior Showmanship. There will be at least a 15 minute break between the heifer and steer show. Market Steer judging will begin at 7 pm and will be followed by Junior and Senior Showmanship, along with the sale order placing. It should be noted showmanship is open only to Anderson County 4-H and FFA youth who meet the general rules and guidelines for exhibitors. The event begins to wrap-up on Thursday, April 18 with the Buyers’ Dinner at 5:30 pm followed by the premium auction sale at 7 pm. The event concludes on Friday, April 19 with clean up.